Milk Mustache Campaign…Send me to NYC! Got Milk? While I was at BlogHer I got the chance to make a short video to support the Milk Mustache Campaign as NoThankYouPlease.com. Our goal was to tell you how we incorporate milk into our morning routine. There were so many great entries and one lucky winner will be going to New York City to meet the new celebrity who will be sporting the Milk Mustache! The winner is selected by how many votes each video will receive. Head over to the Milk Mustache Campaign and watch my ten second video! Help send me to NYC and vote for my video! You can vote once a day until August 31st! It’s so rare to see any kind of coupon for milk. “Real California Milk” is celebrating June Dairy Month by offering three great Real California Milk coupons! 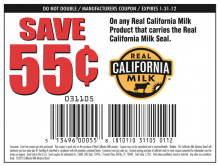 These coupons are valid on dairy items with the “Real California Milk” logo. Hurry, leave a comment and let me know if you would like (5) $1.00 off Horizon Organic Single Serve Milk coupons! TWO winners will be selected. I’ll let you know at the end of the day today who the lucky winner is! This giveaway is open to U.S. residents only. The giveaway will end on Thursday, May 27th at 9:00 p.m Pacific. At that time, I’ll select a random winner. The winner will be notified via email, so please use a valid e-mail address in the comment form so I can contact you if you’ve won. Charlene at My Frugal Adventures let us know about this great deal on Milk. There is a new nationwide catalina that started on 3/19 and runs through 4/10. Offers Mar 22, 2010 in free, groceries, milk · Expired! Go to the Great Gallon Give for a chance to win milk for a year. Just for participating, you’ll get a coupon for a free half gallon of chocolate milk with the purchase of a gallon of regular milk. This is a limited promotion, so get your coupon fast.